We saw in Chap. 4 (Stokes' law) that the translational viscous drag on a spherical particle is 6πηav. Similarly, the viscous torque on a rotating sphere is 8πηa3(dθ/dt). Let’s calculate this torque. We always learn something when we see where such a result comes from. 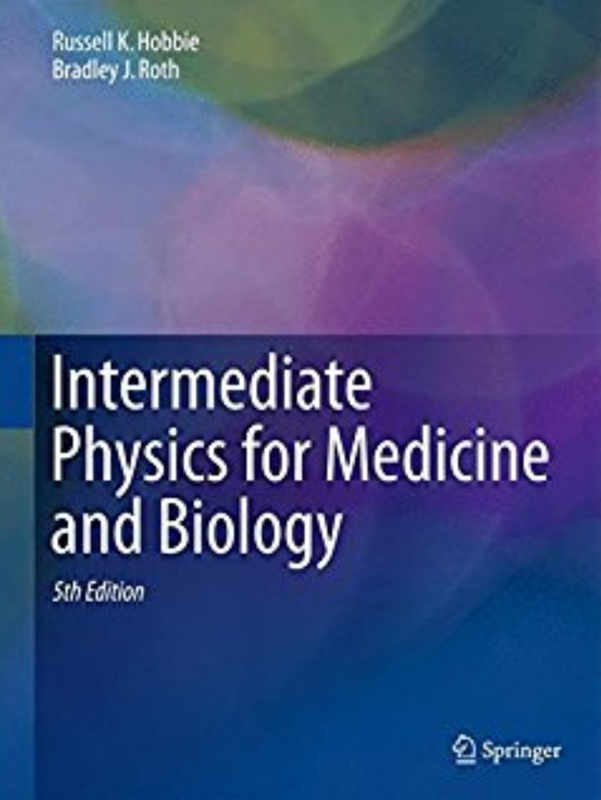 To begin, we will redo Homework Problem 46 from Chapter 1 that asks you to calculate the translational Stokes’ law by considering a stationary sphere in a moving viscous fluid (equivalent to a sphere moving through a stationary viscous fluid). Below is the analogous problem for a sphere rotating in the same fluid. vr = vθ = p = 0. (b) Integrate the shear torque over the sphere surface and find an expression for the net viscous torque on the sphere. When I first tried to solve part (b), I kept getting an answer that was off by a factor of 2/3. I checked my work several times, but I couldn’t find any mistake. After much fussing, I finally figured out my error. For the shear stress at the sphere surface, I was using η dvφ/dr. This seemed right at first, but it’s not. 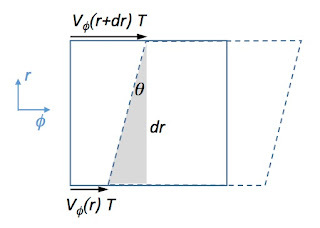 The shear stress is actually η (dvφ/dr – vφ/r). Why? I could just say that I looked up the expression for the shear strain εrφ for spherical coordinates and found it had two terms. But that’s no fair (and no fun). We have to understand what we are doing, not just look things up. Why does the expression for the shear stress have two terms? Let’s start on page 16 of IPMB, where Russ and I note that the shear stress is the viscosity times the rate of change of the shear strain. We need to see how the shear strain changes with time. There are two cases. 1. The first case will give us the familiar dv/dr expression for the shear stress. Consider an element of fluid with thickness dr, as shown below. tanθ = (vφ(r+dr) T – vφ(r) T) / dr . 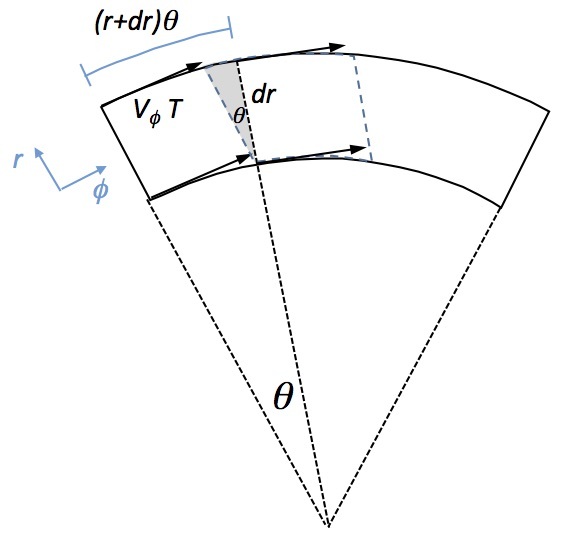 In the limit as dr goes to zero, and for small angles such that tanθ is approximately θ, the shear strain becomes dvφ/dr T. Therefore, the rate of change of the shear strain is dvφ/dr, and the contribution to the shear stress is η dvφ/dr. This is where I got stuck, until I realized there is a second case we must consider. 2. Even if vφ does not change with r, we can still get a shear strain because of the curvilinear coordinates. Consider the arc-shaped element of fluid shown below. so the shear stress is η vφ/r. Notice that in the first case the top side is sheared to the right, whereas in the second case it is sheared to the left. We need a minus sign in case two. In general, both of these effects act together, so the shear stress is η (dvφ/dr – vφ/r). For a velocity that falls as 1/r2, the dvφ/dr term gives -2/r3, while the -vφ/r term gives -1/r3, with a sum of -3/r3. I was getting a factor of two when I was supposed to get a factor of three. Are you still not convinced about the second term in the stress? Look at it this way. Suppose the velocity were proportional to r. This would imply that the fluid was rotating as if it were a solid body (all the fluid would have the same angular velocity). Such a pure rotation should not result in shear. If we only include the dvφ/dr term, we would still predict a shear stress. But if we include both terms they cancel, implying no stress. Let me outline how you do the integral in part (b) of the homework problem above. The torque is the force times distance. The distance from the axis of rotation to the surface where the shear acts (the moment arm) is a sinθ. The force is the shear stress times the area, and the area element is a2 sinθ dθ dφ. You end up getting three factors of sinθ: one from the moment arm, one from the shear stress, and one from the area element, so you have to integrate sin3θ. (c) Show that the velocity distribution in Problem 46 ½ is incompressible by verifying that the divergence of the velocity is zero. Appendix L will help you calculate the divergence in spherical coordinates. Finally, how did I get the velocity distribution vφ = ω a3 sinθ/r2 that appeared in the homework problem? When the pressure is zero, the velocity during low Reynolds number flow, known as Stokes flow, obeys ∇2v = 0. This is a complicated equation to solve, because v is a vector. In Cartesian coordinates, the Laplacian of a vector is just the Laplacian of its components. In curvilinear coordinates, however, the r, θ, and φ components of the vector mix together in a complicated mess. I will let you try to sort that all out. Don’t say I didn't warn you. This is what makes you such a good teacher. Your approach to the problem - you speak to your audience and invite them to join in the thought process of problem solving. The best way to teach is to walk along side the student.